Ancient Native Americans called the Old Copper peoples once populated the island, mining its rich copper beds. They extracted the mineral by heating the native rock with fire and then dousing it with cold water, causing the rock to crumble, leaving the copper behind. They then extracted the larger pieces for use as hammers and chisels, but never developed a method for heating the smaller particles. In the early 1920s Pennsylvania newspaper editor William P. F. Ferguson excavated the purported remains of an Old Copper village near the site of ancient copper mines, but the authenticity of his findings were debated. When European settlers tried to revive copper mining on the island in the 1840s (the island was then rumored to be made entirely of copper), they found little activity by natives outside of a seasonal fishing site on Grace Island and a maple sugaring camp at Sugar Mountain. Copper enterprises would come and go again in the 1870s and 1890s. Some of those miners stayed to try their hands at commercial fishing, which first came to the island in 1800 with the Hudson’s Bay Company. Later the American Fur Post fishing fleet would thrive on Isle Royale, particularly between 1837 and 1841, when the company employed thirty fishermen and an untold number of Ojibwe and Metis women, who worked cleaning fish. Many other individuals and fisheries operated from the island, but by far the largest was the A. Booth Company, which recruited fisherman from Norway, offering them equipment, housing, and supplies on credit until they had made their money back. By 1915 more than one hundred fishermen worked the waters around Isle Royale. 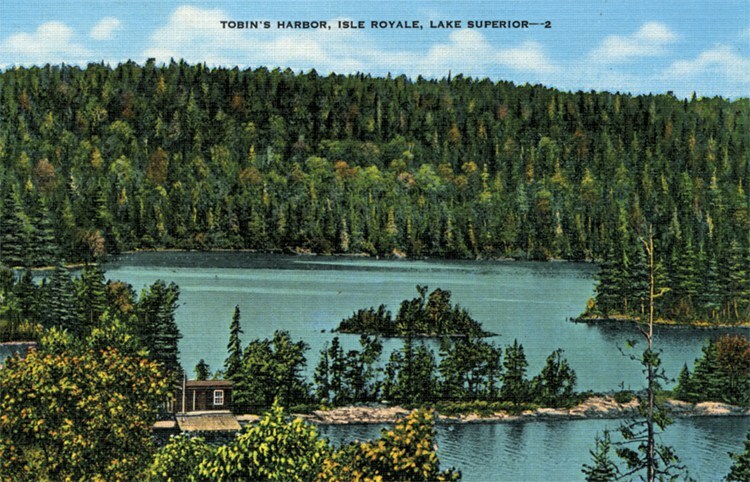 In 1931 President Herbert Hoover signed a congressional authorization to conserve “a prime example of North Woods Wilderness.” Nine years later President Franklin D. Roosevelt established Isle Royale National Park. This act, along with the invasion of exotic fish such as smelt and the sea lamprey, dramatically reduced commercial fishing. As of 1990 only one fisherman dropped his nets near Isle Royale, operating a family fishery over one hundred years old. Many of Isle Royale’s one-time fishermen turned to tourism to earn their keep, some long before the industry died out. John’s Hotel, the island’s first resort, was built in 1894. Other resorts and lodges soon followed, offering guests such activities as dancing, tennis, bowling, and fishing—they even built a golf course on Belle Isle. Like the North Shore, Isle Royale was promoted as a haven for hay fever sufferers. By the 1930s the archipelago’s smaller islands were dotted with summer homes. Today much of Isle Royale, despite its long history of human activity, remains an untamed wilderness.